Poster application period for International ERATO Higashiyama Live-Holonics Symposium 2014 is extended. New deadline is August 12. We are looking foward to your application! 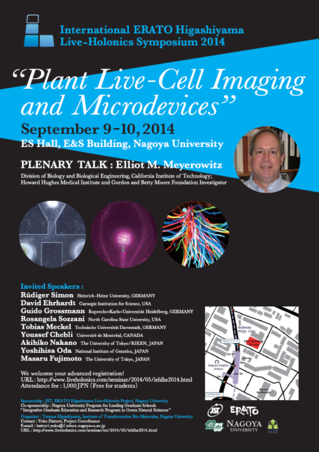 We will have our first international symposium, International ERATO Higashiyama Live-Holonics Symposium 2014 “Plant Live-Cell Imaging and Microdevices” in September 9 -10. The tentative program is below. We also call for poster presentation. Poster session will handle inquiries on a first-come and first-served basis. For registration, please enter this [Registration Form] site. [News] Dr. Arata, a group leader of Nano-Engineering Group, gave a presentation at Harvard University on June 4th. 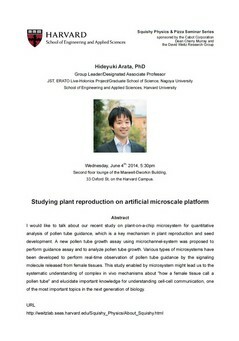 Dr. Arata, a group leader of Nano-Engineering Group, gave a presentation at Harvard University on June 4th.